Небольшая компания "Бидмор" производила по лицензии самолеты "Сопвич", в том числе истребитель "Пап". Когда командование флотом выдало заказ на палубный истребитель со складывающимся крылом, в "Бидмор" было решено разработать такой самолет на основе истребителя "Пап", который уже применялся на авианосцах. Новый самолет представлял собой деревянный двухстоечный биплан. Крылья были выполнены меньшего размаха, но с большей хордой. Для придания жесткости бипланной коробке при складывании крыльев назад были установлены дополнительные стойки. У нижнего крыла появился центроплан. На первом прототипе для удобства хранения самолета в ангаре было оборудовано складывающееся шасси. Из-за его узкой колеи на нижнем крыле были размещены предохранительные дуги. В последующем устанавливалось обычное шасси с колесами или легкими лыжами, однако дуги сохранились. В серию самолет пошел под индексом S.B.3F (Ship-board Folding - "палубный складной"). Вариант S.B.3D (Droopping - сбрасывание) оснащался сбрасываемыми при вынужденной посадке на воду шасси и надувными поплавками. Пулемет "Льюис" устанавливался на центроплане верхнего крыла. Было изготовлено 100 истребителей, однако только 36 из них использовались флотом на авианосцах "Фуриус", "Пегасус", "Наирана". The award to Beardmore of the first large Pup contract for the Admiralty and the special armament provisions connected with this early association having been recorded, it remains to note that the Sopwith Pup aeroplanes ordered as such from William Beardmore & Co Ltd., Dalmuir, Dunbartonshire, Scotland, were Nos. 9901-9950 and Nos. N6430-N6459. From these aeroplanes 9950 was selected for a metamorphosis - a transformation, at least, which represents one of the most imaginative (if one of the less successful) Naval-air undertakings on the British technical record, spattered though this record is with 'make-dos', ‘mods' and 'variants'. Stowage-space for Pups in the smaller classes of vessel involved in Naval operations generally and anti-Zeppelin work in particular being clearly at a premium, Beardmore undertook a complete redesign of the Pup accordingly. Not only were the wings (now without stagger, and with less dihedral) adapted to be folded 'Folding Pup' being a popular name for the aircraft but the landing gear likewise was largely 'retractable' into the fuselage. Later the gear was fixed, but could be jettisoned for emergency alighting at sea. Flotation gear, jury struts and wingtip skids were added in the early stages, the control system was redesigned and the fuselage slightly lengthened all these features being connoted by the new designation W.B.III. Though some of the novelties were abandoned or mitigated, one hundred W.B.IIIs were ordered; and though not all reached Service units, at one time the carrier Furious had fourteen of her own. The Beardmore W.B. III was introduced during 1917 and, although it can lay claim to no memorable engagements with the enemy, it is nevertheless interesting historically as an early attempt to produce an aircraft exclusively for carrier-borne flying. It was not an original design, being a derivative of the Sopwith Pup, but the ingenuity that went into its modification for aircraft-carrier work was quite remarkable. The adaptation was the work of Mr G Tilghman Richards, and the manufacturers were no strangers to the Pup, as they had been the first company to build Pups under licence for the RNAS. The prototype W.B. III (No.9950) was in fact converted from the last batch of Sopwith Pups built at Dalmuir. It differed from the Pup in having folding wings to conserve hangar space aboard ship. Unlike the Pup, the wings had no stagger and the dihedral angle was reduced. The normal centre-section struts were replaced by full-length interplane struts adjacent to the fuselage and the ailerons were operated by control rods, the upper and lower ailerons being rigidly connected by a light strut. This last feature was abandoned in later production aircraft, which reverted to cable controls. Other modifications included wingtip skids and a lengthened fuselage, which was adapted to carry emergency flotation gear, and a remarkable system whereby the undercarriage was retracted to further economise in space when stored. Two official designations were applied to the W.B. IIIs in service, S.B.3D and S.B.3F. The former indicated an aircraft with an undercarriage which could be jettisoned in the event of 'ditching', the latter a folding undercarriage. Production orders for 100 W.B. IIIs reached Beardmores (N6100 to N6129 and N6680 to N6749), but it is possible that not all were built. On 31 October 1918, 55 W.B. IIIs were officially 'on charge' but only 18 with the Grand Fleet. Aircraft-carriers Nairana and Pegasus. RNAS shore stations at Donibristle, Rosyth and Tlirnholise. Description: Single-seat carrier-borne scout. Wooden structure, fabric covered. Manufacturers: William Beardmore & Co Ltd, Dalmuir, Dumbartonshire. Power Plant: One 80 hp Le Rhone or 80 hp Clerget. Dimensions: Span, 25 ft. (10 ft 4 in folded). Length, 20 ft 2 1/2 in. Height, 8 ft 1 1/4 in. Wing area, 243 sq ft. Weights: Empty, 890 lb. Loaded, 1,289 lb. Performance: Maximum speed, 103 mph at sea level; 91 mph at 10,000 ft. Climb, 9 min to 5,000 ft; 24 min to 10,000 ft. Endurance, 2 3/4 hr. Service ceiling, 12,400 ft.
Armament: One Lewis gun mounted above centre-section firing over airscrew. W.B. III. Dating from 1916-17, this very extensively modified Sopwith Pup, for shipboard service, had a single Lewis gun, for which three ammunition drums were provided (one on the gun). Photographs show single (47-round) drums, but a contemporary account mentioned '300 rounds#, suggesting that double (97-round) drums were intended. The gun was at first carried on a tripod mounting, apparently designed at the Grain experimental station, installed forward of the cockpit, so that the gun fired through a hole in the centre-section. Later the gun was mounted slightly to starboard above the centre-section, firing a little upwards over the airscrew. 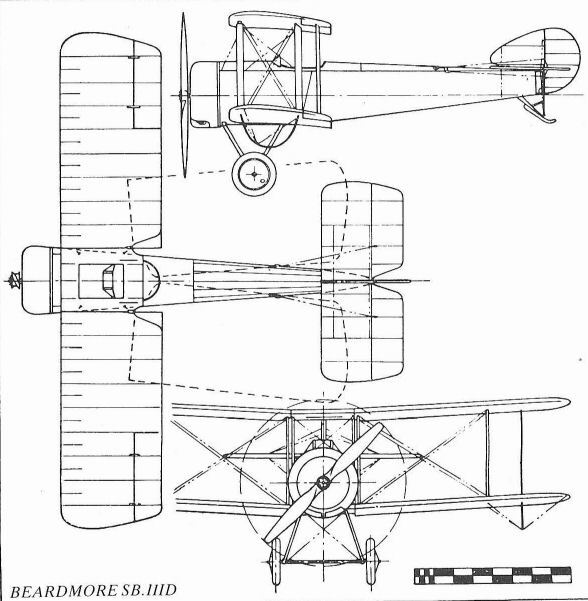 The Beardmore W B. III. was evolved from the Sopwith "Pup" in an effort to turn this machine into a ship-plane, the principal modifications being folding planes and a retractable under-carriage. in order to simplify stowage on board ship. The fuselage and tail unit arc practically of Sopwith design, the overall length being only slightly increased. Instead of four short centre-section struts, four long struts, two on cither side of the fuselage, are fitted with a short horizontal strut connecting them with the upper longeron of the fuselage. The main planes are unstaggered and hinged at the main rear spar close up to the fuselage. Two sets of interplane struts are fitted to each set of main planes one set being placed at the inner edge of the plane in order to preserve the truss when the wings are folded. Ailerons are fitted to upper and lower planes and are operated on the Nieuport principle, the upper and lower ailerons being inter-connected by a strut. An ordinary Vee-type under-carriage is fitted, the front members of the Vee being hinged, and the rear members equipped with a release device operated from the pilot's seat which allows the under-carriage to collapse into the fuselage, leaving half the wheels exposed. The armament consists of a Lewis gun fitted on a special mounting in front of the pilot's cockpit to allow it to fire through an opening in the centre section. Name or type No. of machine W.B.III. Purpose for which intended Ship's Scout. Gap, maximum and minimum 4 ft. 9 in., 4 ft. 9 in. Overall length 20 ft. 2.5 in. Maximum height 8 ft. 1.25 in. Chord 5 ft. 1.5 in. including ailerons 243 sq. ft.
Span of tail 10 ft. 1 in. Total area of tail 34.5 sq. ft.
Area of elevators 11.5 sq.ft. Area of rudder 4.5 sq. ft.
Area of fin 3.5 sq. ft.
Area of each aileron 5.75 sq. ft.
total area 23 sq. ft. Maximum cross section of body 4.6 sq. ft.
Horizontal area of body 17 sq, ft.
Vertical area of body 39 sq. ft.
Engine type and h.p. Clerget or Le Rhone 80 h.p. Airscrew, diam. and revs. 8 ft. 6 in. ; 1,200 r.p.m. Weight of machine empty 880 lbs. Load per sq. ft. 5.3 lbs. Weight per h.p. 16.1 lbs. Tank capacity in hours 2.75 hours. Tank capacity in gallons 18 gallons. Speed low down 103 m.p.h. Speed at 10,000 feet 88 m.p.h. Landing speed 40 m p.h. To 5,000 feet in minutes 9 minutes. Disposable load apart from fuel 300 lbs. Total weight of machine loaded 1290 lbs. The W.B.III single-seat shipboard fighter was an extensively modified variant of the Sopwith Pup with manually-folding mainplanes and folding main undercarriage members. The prototype (a modified Pup) was officially accepted on 7 February 1917, and 100 production W.B.IIIs were ordered under the official designation S.B.3. Armament comprised a single 0.303-in (7,7-mm) Lewis gun which fired upwards through a cut-out in the upper wing centre section, and the W.B.III could be fitted with either the seven-cylinder Clerget or nine-cylinder Le Rhone 9C rotary, both of 80 hp. The first 13 production W.B.IIIs had folding undercarriages similar to the prototype and were known as S.B.3Fs, but subsequent W.B.IIIs had jettisonable undercarriages (S.B.3D) and flotation equipment. The S.B.3D version saw some service aboard British carriers, one was used in an unsuccessful attempt to fly from the forecastle of the battle cruiser HMS Renown and several were supplied to Japan. Max speed, 103 mph (166 km/h) at sea level, 98 mph (158 km/h) at 6,500 ft (1980 m). Time to 6,500 ft (1 980 m), 12.15 min. Empty weight, 890 lb (404 kg). Loaded weight, 1,289 lb (585 kg). Span, 25ft 0 in (7,62m). Length, 20 ft 2 1/2 in (6,16 m). Height, 8 ft 1 1/4 in (2,46 m). Wing area, 243 sqft (22,57 m2). 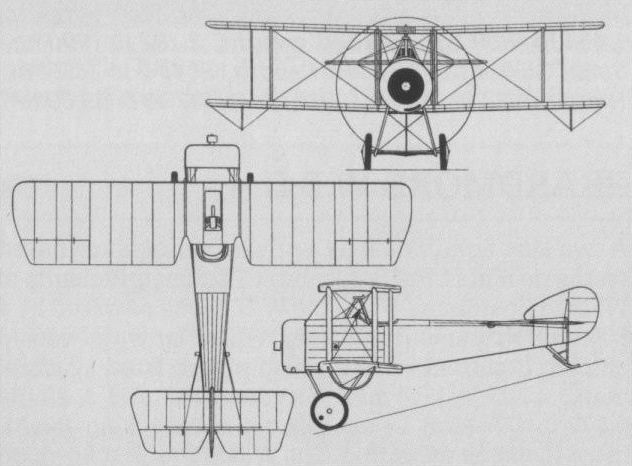 Although designed to have a folding undercarriage, most W.B.IIIs had one of jettisonable form. The second production Beardmore W.B.III with jettisonable undercarriage, as adopted for the subsequent S.B.3D version for naval use. 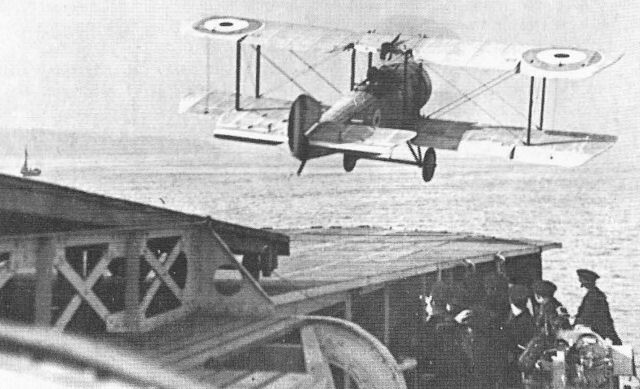 A Beardmore W.B.III leaves the steep forward launching platform of HMS Pegasus in 1918. Прототип SB3 в положении для хранения в ангаре авианосца. The Beardmore Type W.B.III Folding Ship plane (80 h.p. Le Rhone Engine) with wings and chassis folded for stowage. 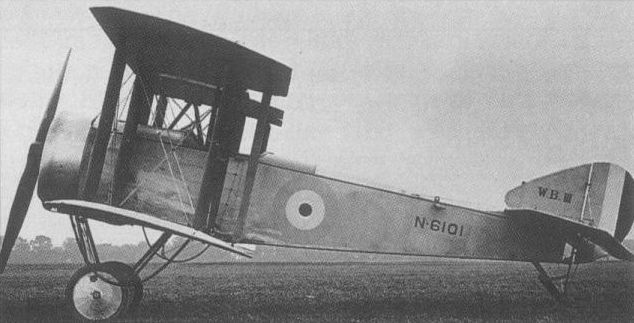 The aeroplane which has suffered 'compressibility' is the first Beardmore W.B.III (modified Pup No. 9950) which is the subject of a note in the text and which led to a new Service type (S.B.3D). S.B.3D version for naval use.